Toyota Prius + | What Car? 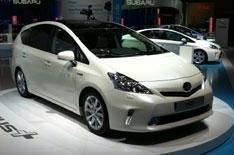 This is the Toyota Prius + - the world's first seven-seat hybrid car. The Prius-based seven-seat MPV made its debut at the Geneva motor show in March this year as a concept car, but this is the first chance to see the version that will reach showrooms in 2012. Clever re-packaging means that the Prius + is a proper seven-seater, with space for adults to sit in the rear-most seats. Compared with the standard Prius there's an all-new lithium-ion battery pack, which has been moved from beneath the boot floor to the centre console between the front seats. It's smaller than the nickel metal hydride pack in the standard Prius and sits vertically rather than horizontally. The Prius + is 155mm longer than a standard Prius, 30mm wider, and 85mm higher, with a wheelbase extended by 80mm, giving enough room to accommodate adults in all three rows of seats, says Toyota. With seven passengers on board, Prius+ provides 200 litres of cargo space. With the third seating row stowed, this figure rises to 505 litres. Power is from a 1.8-litre petrol engine and a 60kW electric motor, which combines to give a total output of 134bhp. 0 to 62mph takes 11.8 seconds, while top speed is 106mph. Average fuel economy is 65.7mpg and the car emits 99g/km of CO2.